Pears, persimmons, and pomegranates, all the quintessential fall fruits, with Holiday spiced pecans and a sweet lemony maple vinaigrette. It’s a lets take all the fruits that are in season and make a deliciously colorful and festive salad out of them kinda situation! For the Pecans:Preheat oven to 325°F. Whisk together brown sugar, cinnamon, salt, nutmeg, and cayenne in a medium bowl. Add in melted butter and stir until well combined. Add in pecans and toss to thoroughly coat nuts with sugar mixture. Spread pecans onto a foil lined baking sheet. Transfer to oven and bake for 15 minutes. Remove pecans from oven and let cool to room temperature and then roughly chop. In a medium bowl, whisk together shallot, maple syrup, mustard, and vinegar. Whisking constantly, drizzle in remaining 1/4 cup (60 ml) olive oil. Season to taste with salt and pepper. Arrange frisee & radicchio on serving platter and toss with salad dressing, to taste. 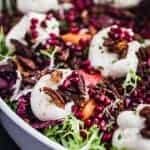 Arrange fruit and burrata and top, sprinkle with pomegranate seeds and pecans. Drizzle more dressing. Enjoy. Buy the best damn local organic fruit you can find. Cutting with a dull knife is more dangerous than a sharp one! Friends, keep this in mind for thinly slicing the fruit. Choose pears and persimmons on the firmer side so they’ll cute nicely. If cutting pears much in advance, squeeze them with some lemon to keep from browning. Not all Burrata is created equal. Buy the good stuff. See rant on this above. De-seeding a pomegranate is deliciously messy ~ do it over the sink get in the sink! Meditate. Rejoice in the fruits of the fall/winter. Pecans can be made up to 1 week in advance and stored in an airtight container. Dressing can be made up to 3 days in advance and stored in the fridge.